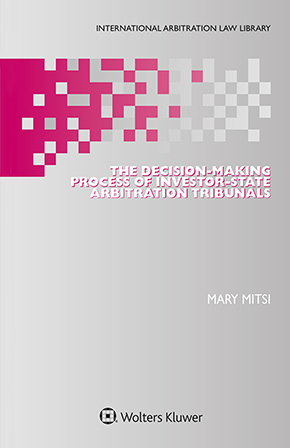 The Decision-Making Process of Investor-State Arbitration Tribunals explores the ways in which arbitral tribunals interpret the law in investor-state disputes. It examines the emergence of a specialised way of decision-making adapted to the characteristics and needs of investment arbitration. In the course of a single investor-state dispute, an arbitrator may make numerous decisions, from interpreting the treaty or national laws to taking into account case law, customs and policies. In practice, this process raises important issues regarding the consistency of arbitral awards and the predictability and legitimacy of the arbitral decision-making process. This is the first book to offer an in-depth analysis of the transnational characteristics of investment arbitration and to analyse the interpretive arguments of investment tribunals. It particularly examines the way tribunals reason their awards making reference to treaties, precedent, policies, general principles of law and customary law in their decision-making process. how decision-making is connected to the issues of predictability, consistency and the rule of law. The core of the book proposes a novel, full-fledged dialogical network theory for analysing the interpretation process. As an exemplary demonstration of developing theory to keep up with practice, this unique book provides a deeply engaged means for enhancing the practice of international arbitration. Its introduction of a new field of interdisciplinary analysis employing legal argumentation theories is sure to provide inestimable guidance for institutions and policymakers, especially in light of recent proposals for the creation of a permanent investment arbitration court. Given that unveiling the legal decision-making process is critical for the well-being of the whole dispute resolution procedure, and that being aware of how arbitrators interpret the law can constitute a roadmap for counsel’s arguments and approaches when dealing with cross-border disputes, the topic of this book is relevant for both academics and practitioners, and its significance can only grow as recourse to investor-state arbitration continues to expand.